The master added another flavoury half century to his kitty in this first innings of 3rd test vs the kiwis, this being his 95th. Though I would say he missed out as he was looking good for more than a ton. 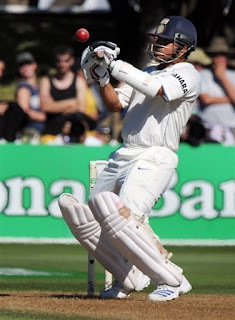 Joining Gambhir at 73/1 and then Dravid at 75/2 he scored a excellent 62 runs of just 85 balls with 11 4's in it. With a strike rate of almost 73% the master was literally jumping on top of every ball to smack it to boudnary. He looked in excellent touch especially through the cover and point area where he wacked a few fours. Our Bombay Bomber is certainly continuning to be a thorn to the black caps and in this innings again he looked pretty comfortable and was trying different strokes including a few over the keeper (like in the picture to the right). He lost his wicket to a similar flashy stroke to Chris Martin who ended with best figures for NZ with 4 wickets. Just like every fan is, I am disappointed that he missed out on another century but I hope or rather sure that his form would continue in the second innings and in fact right through the IPL :) so that we can more of him. What a glorious innings. I thought he was definitely going to score another ton but was done in by Chris Martin. Anyway am hoping he scores a century at least in the next innings. Am sure the team is going to win the series 2-0 so it will be even better if he leaves NZ on a personal high.